You may not have heard of Three Fields Entertainment but you may be familiar with our past work. We started the Burnout series back in 2000 and were Creative Director (Alex) and Executive Producer (Fiona) on every game in the series. In 2013 we left Electronic Arts and in 2014 started Three Fields Entertainment, which with just seven people is a return to our early days with a small passionate team working together more like a music band than a typical development team. We have made four games to date and Dangerous Driving is the most exciting yet as it is a return to a genre that we love and have always been passionate about. All genres have their core ingredients that become genre standards and the games we have made have had a bit of influence in forming the core ingredients of aggressive racing genre. We couldn’t put persistent wrecks in the game without using them as a crash and Takedown variant. Take someone down into a persistent wreck and it’s a Junkyard Takedown, crash into one yourself and it’s a Nervous Wreck – and believe us you will be when you’re on the last lap, desperately hanging on to first place hoping a wreck isn’t going to take you out. Road Rage is back but we wanted to introduce new ways to play so in later events we have upped the challenge level. ​How many Takedowns can you score when Shunts are disabled – or when only Traffic Takedowns count? This can get really challenging and we can’t wait to see the leaderboards for Traffic Takedowns. Our office best to only about 10! At the start of the game it’s you against one Target vehicle but as the game progresses and you unlock better cop cars you’ll take on faster and more numerous opponents. This is a really intense mode played on our Point to Point tracks and you need to stop all the targets before you reach the end. In this genre vehicles can end up being the same, just a model swap with very similar stats. In Dangerous Driving we wanted to make car choice more meaningful. So for example the Tuned version of each car earns and uses boost much quicker than any other, making it perfect for Heatwave events (see pt.8 below). Advanced vehicles are stronger, hit harder and take less damage. Prototype vehicles are the ‘best’ in that they are the fastest but they’re made of carbon fibre so are the most fragile. We didn’t want there to be just one ‘best’ car when we take the game online (see pt.10!). You make a choice based on the mode and your playing style. Another staple for the genre is AI that is designed to stay around the player and give them a good race. In Dangerous Driving we used real player performance to ‘teach’ the AI to drive and in most of the game modes the AI is racing to a time set by a real human player – take Face Offs for example – these guys are gunning for it just like the human player that was used to create their data making for an incredibly intense experience. The only way to throw them off is to take them down – repeatedly. Following the theme of cars tailor made for modes – take a Tuned vehicle into a Heatwave mode and you get a very special and unique advantage. Heatwave events are purer race events (more similar to races in say Burnout 2) and dropping a whole boost bar in one go refills the boost, meaning you can chain your boost repeatedly. Tuned vehicles are perfect because they earn and use boost more quickly so you can chain them quicker – but also each successful chain in a Tuned car adds 2 mph to your top speed – until you crash. Interestingly we have no idea what the limit is on this as we have always crashed after about 30-35 chains!! So we’re looking forward to seeing the YouTube videos of how far players push it! We’ve long believed that the music people drive to is intensely personal so we really wanted to integrate Spotify and give people endless choice. Authorise your premium Spotify account in the Audio menu and you will then be able to control your music inside the game. Follow the development team’s own Spotify account (‘Three Fields’) or choose your own personal playlist (we are fans of Spotify’s Mixed for you ‘Songs to Sing in the Car’). In the first month after release we will release DLC that adds online to the game and we’re really excited about how all the new features will transfer into online – there will be online racing and of course online Road Rage – and persistent wrecks, Junkyard Takedowns and Nervous Wrecks (see above) will all feature strongly! Dangerous Driving releases on PlayStation 4 on 9th April. You can pre order it now until 8th April and receive an exclusive car (only available to digital pre-order customers). 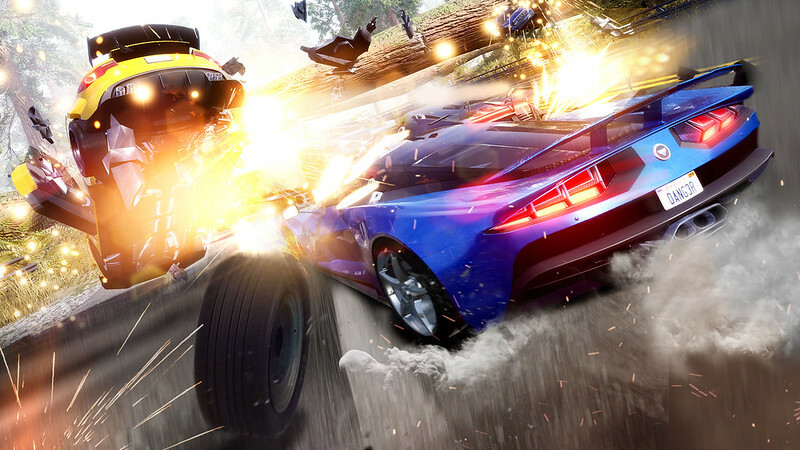 The post 10 ways Dangerous Driving evolves Burnout’s aggressive racing formula appeared first on PlayStation.Blog.Europe.